Some data points released over the past week seem to lend credence to the "profit trap" hypothesis as it relates to Apple and Samsung. The first was Samsung's announcement of a profit decline in Q4. The second was a set of data points from Kantar which showed a decline in the iPhone's US market share. Global market share declines could be attributed to many reasons, including market expansion in lower tiers and it is usually difficult to gauge revenue and profits based on that data alone. However, the nature of the US subsidized pricing model has helped the iPhone become a player in nearly all market segments. In addition to this, smartphone sales have been flattening over the past year, making US market share data very relevant to any discussion on sales. 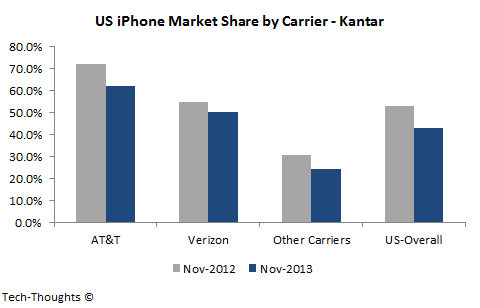 The chart at the top of this post shows the iPhone's market share across US carriers. The iPhone seems to have taken quite a hit of late, with market share declining by ~10% across the US. Among carriers, we saw a 10% decline at AT&T, 5% decline at Verizon and 7% decline at other carriers (including Sprint and T-Mobile). This seems consistent with the Google Trends data I have been tracking. Kantar has suggested that T-Mobile's Uncarrier strategy served as the catalyst for this pattern. While this is undoubtedly true, this doesn't completely explain why this caused an iPhone market share decline at other, larger carriers. 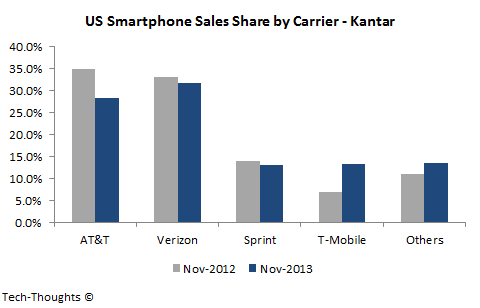 The chart above shows smartphone sales share by US carrier. Among the four largest carriers in the US, only T-Mobile gained share, with AT&T being the biggest loser. This suggests that T-Mobile is drawing price sensitive customers away from other carriers (notably AT&T). As I explained in my post on "profit trap mechanics", the US market has the highest proportion of "less valuable" iPhone customers. This data suggests that the price-sensitive customers acquired by T-Mobile may have been potential customers for "free" iPhones (on contract) at other carriers. Therefore, T-Mobile's transparent pricing forced these "less-valuable" iPhone customers (or potential customers) to consider "good enough" offerings from competing OEMs. This may have caused a decline in iPhone's market share at both T-Mobile and other victimized carriers. In other words, transparent pricing has forced a rethink on previously "obvious" purchasing decisions. Unsurprisingly, AT&T has responded by emulating T-Mobile's transparent pricing structure, which should cause even more price sensitive customers to switch to cheaper smartphones. Samsung's Galaxy range probably faced the same struggles and I suspect that it was one of the primary causes of their profit decline (apart from the special bonus). Of course, since Kantar's data only covers three months ending with November, there's always the possibility that premium smartphone sales made up for these declines in December. However, this has clearly been caused by changes in pricing paradigms and the underlying basis of competition -- factors that are unlikely to be affected by seasonal factors.